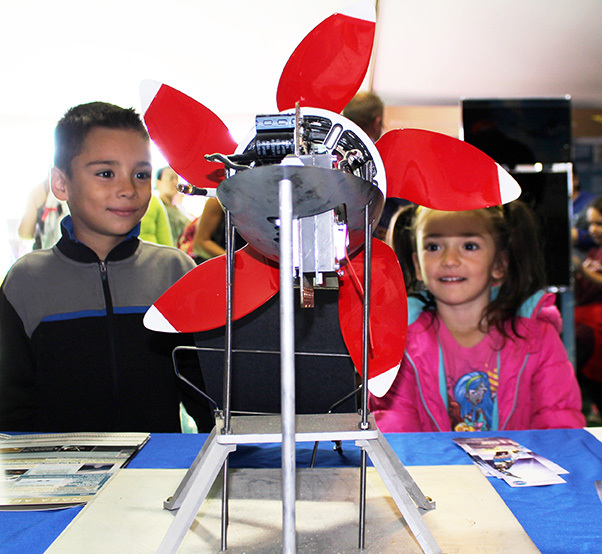 An electric motor used for research at NASA Armstrong Flight Research Center in California is one of the displays at the NASA exhibit. A virtual rainbow of hot air balloons will grace a canvas of southwestern sky at the 46th annual Albuquerque International Balloon Fiesta in New Mexico from Oct. 7-15. When the balloons are not active, attendees with have lots to see, including a NASA exhibit with information on the latest aeronautics innovations. “Balloon fiesta attendees will have an opportunity to learn the latest about NASA’s research, including the X-57 distributed electric propulsion aircraft and other New Aviation Horizons initiative proposed aircraft that will lead to reduced aircraft noise and emissions and maximized fuel economy,” said Karen Rugg, lead for communications and education for NASA’s Aeronautics Research Mission Directorate. A motor and propeller from a 31-foot-span, carbon-composite wing section called the Hybrid-Electric Integrated Systems Testbed will be on display. 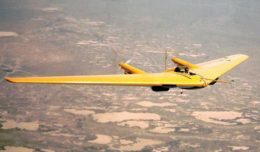 That research project was a step toward the distributed electric propulsion system developed for the X-57 Maxwell, NASA’s first human-piloted experimental aircraft in decades. Under NASA’s Transformative Aeronautics Concepts Program, the wing of an Italian-built Tecnam P2006T is being enhanced to feature an electric system. Eventually a special high aspect ratio wing with a distributed propulsion system will be used. Starting with an existing airframe, engineers will be able to compare the performance of the X-plane with the original aircraft. The project, which involves multiple NASA centers and industry partners, also could lead to improving aircraft efficiency, safety and economic benefits. NASA’s aeronautics efforts are conducted at four field centers across the nation including Ames Research Center and Armstrong Flight Research Center in California; Glenn Research Center in Cleveland and Langley Research Center in Virginia. 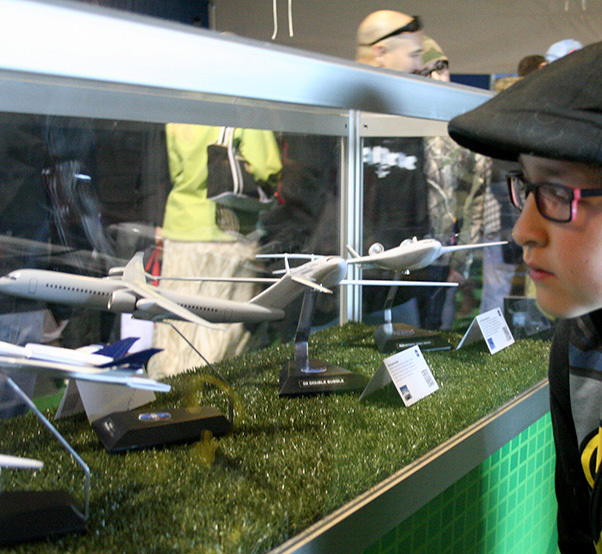 Aircraft concept models representing the possible future of NASA Aeronautics attracts the interest of a fiesta attendee. Another NASA exhibit attraction is a demonstration-sized scientific balloon from NASA’s Balloon Program Office, which is based and managed at NASA’s Wallops Flight Facility in Virginia. Staff members will be on-site at the fiesta to welcome visitors and answer questions about the balloon program’s mission. NASA’s scientific balloons offer low-cost, near-space access for suspended payloads weighing up to 8,000 pounds to conduct technology demonstration tests as well as scientific investigations in fields such as astrophysics, heliophysics and atmospheric research. Standard NASA balloons are very large structures, some as large as football stadiums when fully inflated, comprised of 10 to 50 acres or more of polyethelene film that is similar in appearance and thickness to the type used for sandwich bags, but stronger and more durable. The fall balloon launch campaign is currently underway from Fort Sumner, New Mexico, about 150 miles southeast of Albuquerque. Weather permitting, balloon flights can be seen from the ground, especially at sunrise and sunset. People can track the real-time location of NASA’s balloon missions at the Columbia Scientific Balloon Facility’s website. Also at the NASA exhibit is the Global Learning and Observations to Benefit the Environment, or GLOBE, Observer, which is based at NASA’s Goddard Space Flight Center in Maryland. It is part of the larger program that focuses on students and citizen scientists from around the world to make environmental observations that support NASA Earth science, said Holli Riebeek Kohl, GLOBE Observer coordinator. Observations on clouds and mosquito habitats are made through an app. A cloud observation includes the kind of cloud and the amount of cloud cover and if there is haze and visibility. People who attend the NASA exhibit can learn how to make a cloud observation as well as watching a demonstration on how clouds form and participate in activities to discover sky color and identify cloud types. 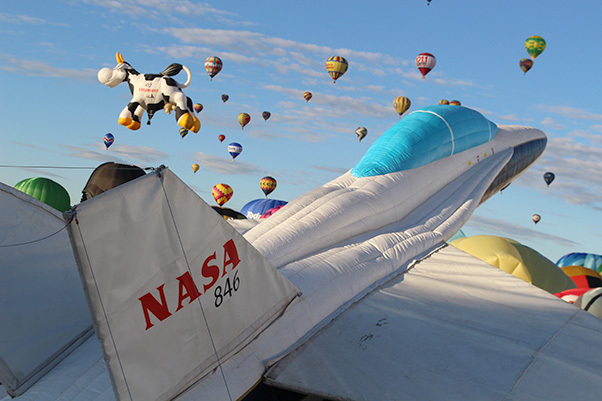 The nose of an inflatable half-scale model of a NASA F/A-18 in front of the NASA Aeronautics exhibit points skyward as a host of hot-air balloons ascend at the International Balloon Fiesta in Albuquerque. In addition, former NASA astronaut Mike Mullane, a veteran of three space shuttle missions, offers a view from above Earth in two presentations. He is scheduled to speak about the Space Shuttle Program and life as an astronaut Wednesday, Oct. 5, at 8:30 a.m. and 10 a.m. MDT at the 7-Eleven Balloon Discovery Center. A display featuring the Stratospheric Observatory for Infrared Astronomy informs visitors about a combination of the world’s largest airborne infrared telescope integrated into a NASA 747SP aircraft. An infrared camera display is used to show attendees how that type of imaging works in the to study of the universe. A high-altitude pressure suit used by pilots of the retired Mach 3 SR-71 and the high-altitude ER-2 Earth observation aircraft will be on exhibit. To show why the suit is needed, a tabletop pressure chamber will show how water boils at low temperatures and marshmallow Peeps expand and contract with pressure. In an event with vehicles full of air, the half-scale, inflatable model of a NASA F/A-18 research and mission support aircraft fits in at the entrance to the NASA exhibit. Attendees could then go inside the display area where they can sit in an F-15 cockpit simulator and picture themselves in the pilot’s seat of the high-performance jet. NASA Armstrong is lead for the agency’s exhibit at the balloon fiesta.